When we first heard of their trip it seemed like any other. They were a young couple with a VW van, a pocket full of spending cash, and a general plan to drive south. It was only as that journey unfolded that we realized this pair, and their van named Nacho, were something special. 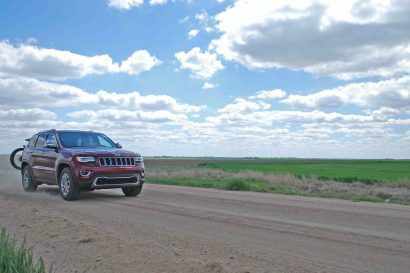 The overlanding community is rife with travelers who have shucked the trappings of the daily grind to pursue a life on the road. While it is inspiring to hear of people on year ten of a protracted epic, we don’t often hear from those who planned a huge odyssey knowing it isn’t a change of lifestyle, but one monster of a bucket list item. For Brad and Sheena Van Orden, their eventual lap around the globe was just another achievement in a long line of impressive accomplishments past and future. 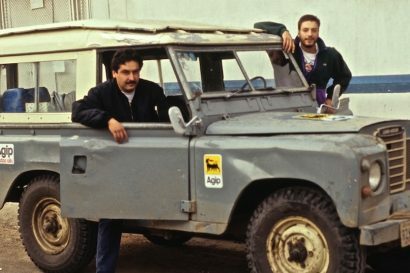 If you frequent Expedition Portal, you probably recognize Nacho from the many superbly written stories we published, all penned by Brad and Sheena from the road. 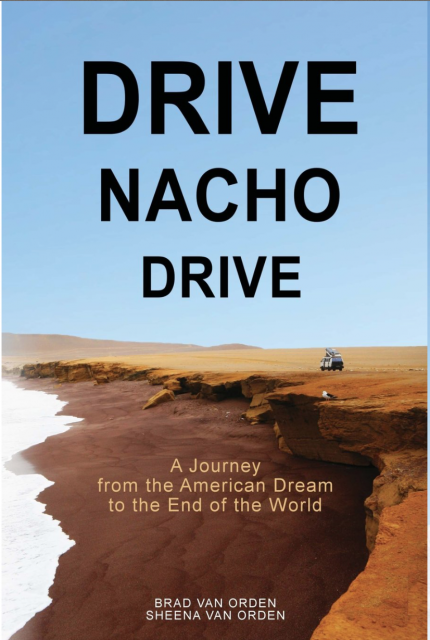 You may have read their eponomously named book, Drive Nacho Drive, or the sequel, 927 Days of Summer. 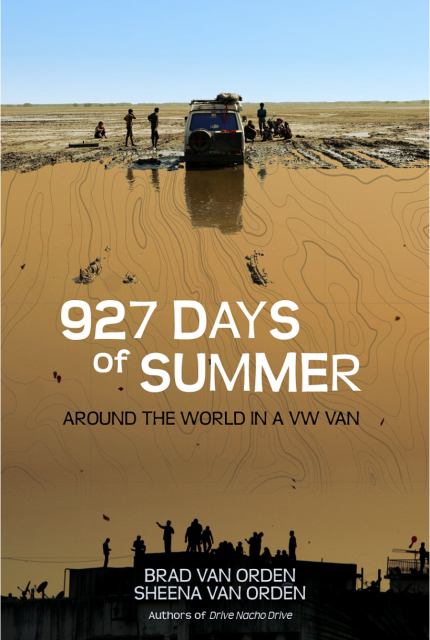 If you like a good adventure yarn, or wonder what it’s like to pilot a VW van around this big blue swirl, you should buy their books and visit their website. If they don’t inspire you to tackle your own dreams and ambitions, nothing will. To cap off the end of their big journey as they embark on a new, even bigger adventure, we thought it fitting to award Sheena, Brad, and of course Nacho, with our 2015 Overlanders of the Year award. Congratulations to Sheen and Brad from all of us at Expedition Portal. 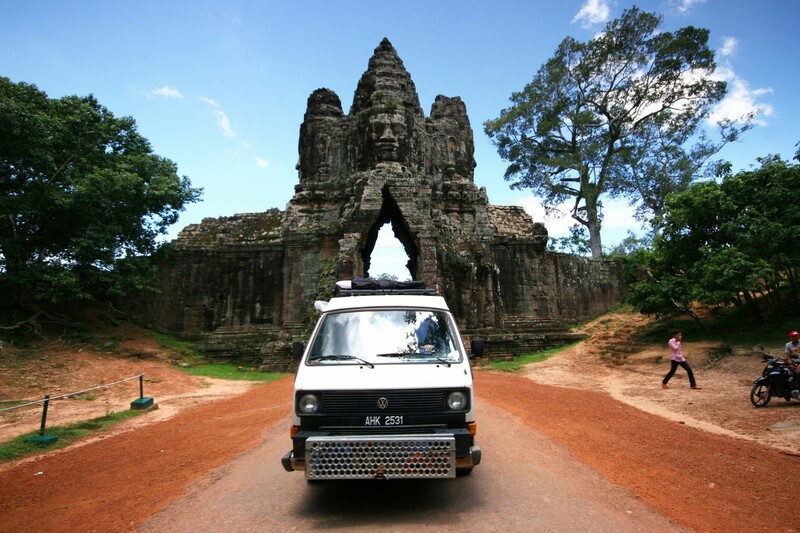 Visiting the ancient temples of Cambodia. Christophe: Before you departed on your big trip, did you ever think you would make it all the way around the world, or did you set out to see how far you could go? Brad: From the moment we conceived the plan, our intention was to drive all the way around the world. Of course, when we sat down and tried to plan such a thing, we quickly discovered a hundred unsurpassable barriers. So instead we just figured that everything would probably work out, and forged ahead anyway. This blind hand waving was a conscious defense mechanism against talking ourselves out of it. 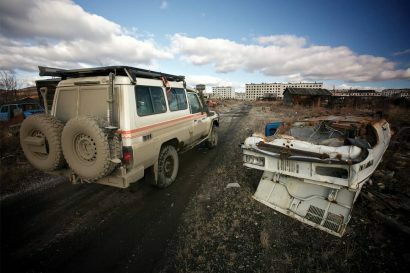 The point of the exercise was to drop everything and live out our wildest dream, and our wildest dream wasn’t to see how far we could drive in a VW camper van; it was to walk out of our house, get in the van, and then drive it all the way around the world. We didn’t know how, exactly, and that’s what made it an adventure. Traveling the barren expanse of Patagonia. When did you hatch your plan to embark on such a long journey, and how long did it take to prepare for it? The idea for the trip actually came while I was standing at my desk at work. A colleague walked by, and I blurted out a suggestion that we drive his van to Tierra del Fuego. 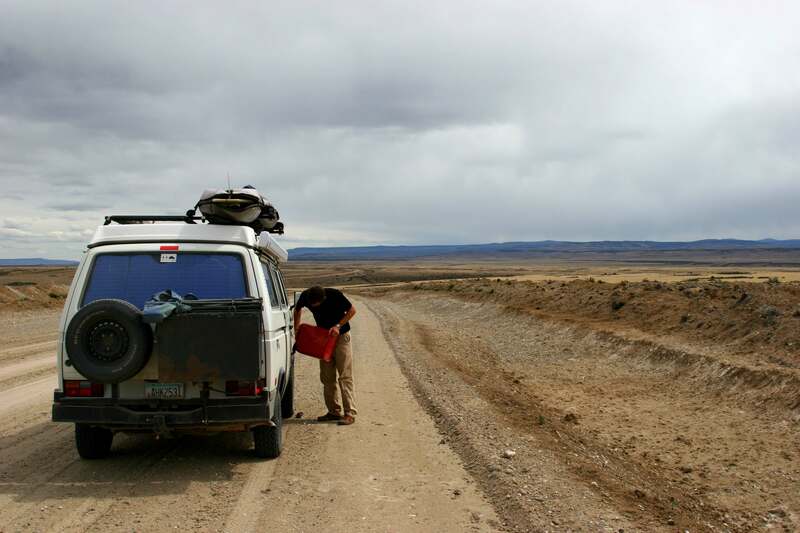 My colleague was the opposite of someone who would drive to Tierra del Fuego in a van, and that’s why I suggested it. It was meant to be funny. He unblinkingly said no, and went away. But a minute later he sent me an article whose title was something like “How to Drive Your VW Van around the World.” I read the title, nothing more, and it struck a chord. I immediately sent the article to Sheena, asking her if she wanted to quit her job so that we could buy a van and drive it around the world. She quickly responded with a yes (she’s a dream woman), and it was a done deal. A life change in sixty seconds. That evening we sketched out a general route, and began to put together a savings plan to enable us to leave in two years. That gave us our timeline to find a van, get it road-ready, prepare ourselves, erase our old lives, and drive away. 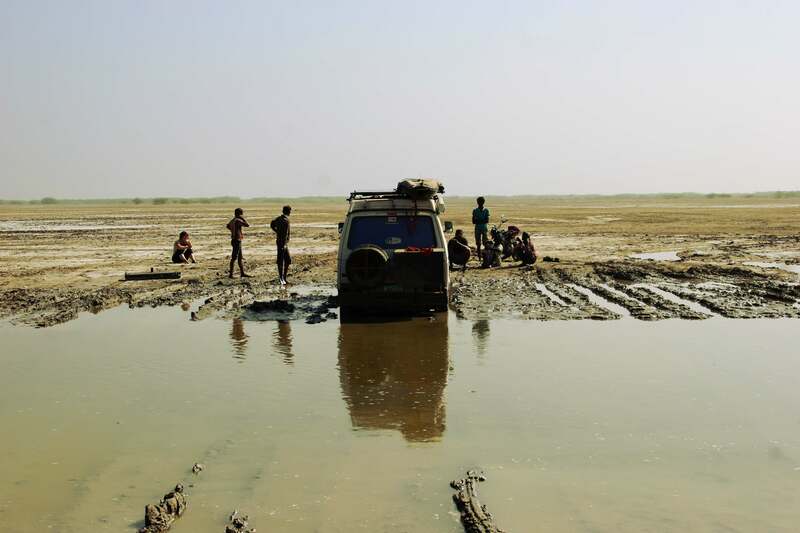 On the Pakistani border, not the first or last time Nacho would see mud. Were you truly ready to go when the time came to leave? Is anyone ready for a trip of that scale? We were mentally ready the moment we decided to go, but the physical readiness lagged. We still had our own human nature to contend with, and as such we had started more van projects than we had time to finish. On the morning of our departure we threw all of the unfinished projects into the van and we just started driving. Eventually we came to our senses and threw away whatever we hadn’t finished. I like the second part of your question. I think we’re all ready to put our mundane lives behind us and hit the road, although we will never feel ready. But if we put one foot in front of the other we eventually find ourselves off and away, watching our own documentary unfold through the windshield. In Drive Nacho Drive, I wrote about how that felt at the onset of the trip, and then I came back to it at the end of 927 Days of Summer in the context of coming back home. I like to go back and read those passages to see how I changed over the course of those two and a half years. Traversing the Atlas mountains of Morocco. The two of you have been together for a very long time. How important is it to have been able to share this experience with your partner, and how does that factor into your future as a couple? The shared experience has to have created quite a bond. Sheena and I have been together since high school, and when we started our trip we’d been together for ten years—nearly a third of our lives. I thought it strange when we told people about our impending trip and they warned us that it would either make or break our relationship. It wasn’t as if we’d just been thrown together by random chance and forced to take on the world, so that worry never took hold in us. One thing that changed when we started driving was that we became each other’s primary sounding board. This was somewhat of a challenge for Sheena especially, as she had grown accustomed to having other ladies around to chat about lady things. In the end we figured out how to get around this and a few other minor challenges, and added them to our repertoire of cohabitation tricks. We emerged stronger, but it was part of a continuum. 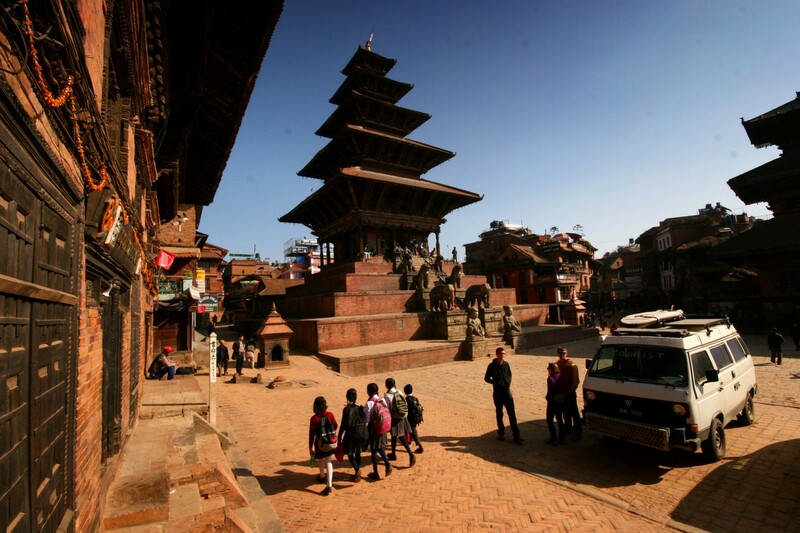 Nacho drives amidst the stupas and temples of Kathmandu, Nepal. What is one thing you to learned to love about your VW van? What one thing did you hate about it? Could you ever possibly sell it, or is it family now? I think the love and hate aspects are one and the same. This van is thirty two years old, and was designed to carry German families along the autobahn for weekend picnics. We took that platform and built a 6,000 pound home on it, which we proceeded to pound into a pulp over 45,000 miles of what might best be described as neglected power line roads. It already had 276,000 miles on it when we started the trip. Needless to say, much of that distance was a procession of breakdowns in inconvenient places, and exercises in inventive problem solving. At times, I really hated breaking down. But having said that, I look back at our trip and the most memorable encounters and experiences came to pass as a result of us driving this van. What would we have to show for this trip if not for Nacho forcing us to stop where we wouldn’t have otherwise stopped? Without a global community of VW van people waiting to show us their culture? We can’t sell Nacho; we have to keep him so our children can drive around the world in it one day. 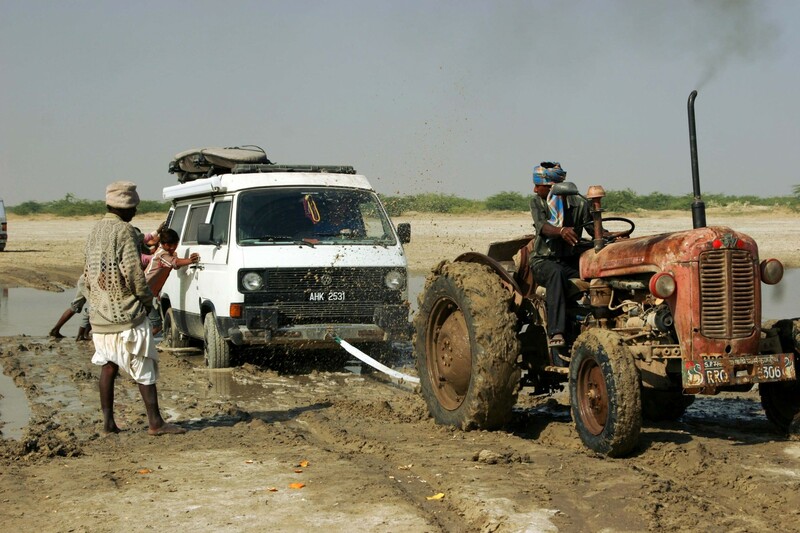 Helping hands extract the Van Ordens from a muddy mess in India. If you could give any would-be traveler one short bit of advice, what would it be? When we first set off we didn’t have a map—no mobile phone, no GPS, no paper map. Our idea was to drive around the world this way, and to rely on old fashioned asking for directions to guide us. We thought it would be a good way to get us talking to the people. While maybe a good idea in principle, it wasn’t such a good idea for various reasons that I won’t get into here, so we broke down and bought a GPS when we reached South America. But in that spirit, my best advice is twofold: don’t plan too much, and focus on the people over the places. With all of the content available on the internet, it’s easy to beat all of the uncertainty out of a would-be adventure by over-planning. Why spoil the surprise? Keep the adventure alive by uncovering the world firsthand. And as you’ll discover, the real treasures of this world are its people, so get out of your vehicle and mingle. 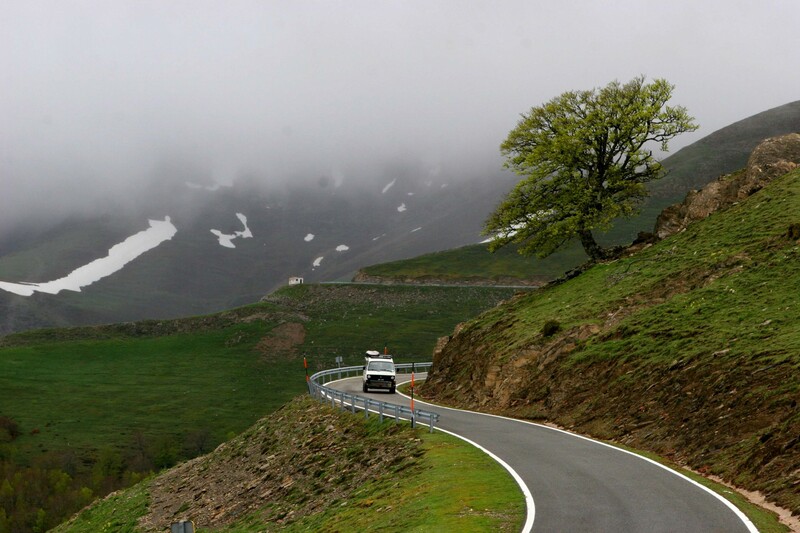 Plying the serpentine roads of the Spanish Pyrenees. And for the token question I have to ask, what is your next adventure? Sheena and I recently spawned an offspring: a charming little gentleman whom we call Remy. Our next adventure is to ensure that this little guy has lots of stories to tell. 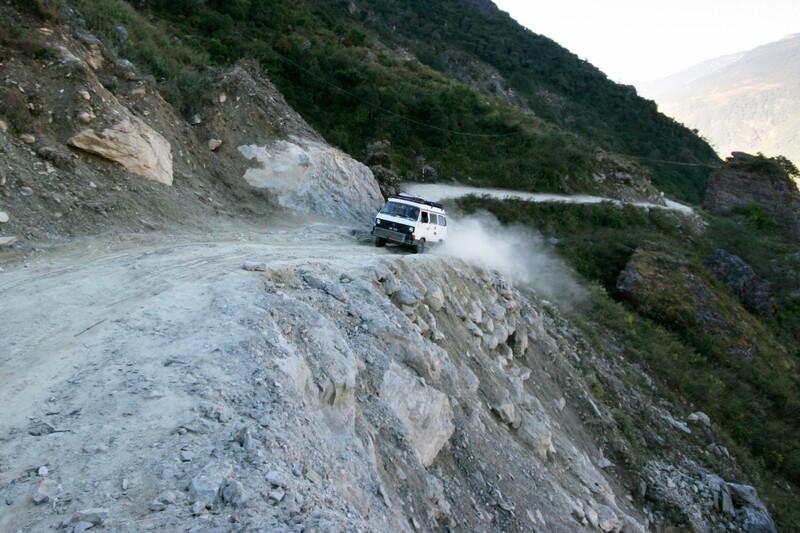 Scrambling for traction, and gasping for air in the Himalayas of Nepal.